“Lucy Derrick is a young woman of good breeding and poor finances. After the death of her beloved father, she is forced to maintain a shabby dignity as the unwanted boarder of her tyrannical uncle, fending off marriage to a local mill owner. But just as she is on the cusp of accepting a life of misery, events take a stunning turn when a handsome stranger—the poet and notorious rake Lord Byron—arrives at her house, stricken by what seems to be a curse, and with a cryptic message for Lucy. Suddenly her unfortunate circumstances are transformed in ways at once astonishing and seemingly impossible. Witches, Fairies, the Luddites and Lord Byron? Oh My! 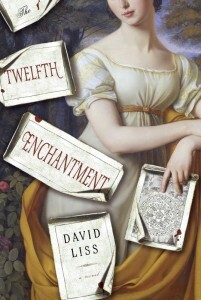 History, romance, adventure and magic all combine in Regency England in David Liss’ newest novel The Twelfth Enchantment. As a lover of all things Regency, I could not wait to see how the author would combine it’s world of society and manners with the fantastical idea of magic and witches among the Ton. Throw in some Lord Byron to boot and you have a page turner that truly seems to work well together despite being a jumble of genres that often seem to many to count. However beware one must be willing to think freely for this is not a book that follows the rules…suspension of belief is a must. Lucy Derrick is a charming main character that is well written and realized especially considering the author is male and his protagonist a female. Often in this instance I find the character may not ring true especially with a woman placed in a historical setting but Liss managed to make Lucy not only real but also quite charming and likeable. She is believable both as an abandoned women at the mercy of her Uncle and as a woman on the brink of discovering her own powers as a witch. As the novel progresses she becomes more and more enjoyable as she embarks upon adventure, intrigue and romance. The supporting characters within The Twelfth Enchantment were also well written and developed including the devilish “bad guys”, loyal friends and of course the handsome suitors. In many instances I found the book reminding me of various past novels such as North and South (Elizabeth Gaskell), Jonathan Strange and Mr. Norell and The Discovery of Witches. It was as if there was a bit of each all wrapped into one with The Twelfth Enchantment. While suspension of belief is required, the novel was both interesting and intriguing on many levels and a well blended version of historical fiction and fantasy for those who enjoy a little more than your average foray into the past. I myself would love to see a sequel later on down the road perhaps? Until then make sure to follow along on this TLC Book Tour and see what other reviewers think about this book. One lucky reader of Stiletto Storytime will win their very own copy of The Twelfth Enchantment. Giveaway ends midnight EST August 29, 2011. US/Canada addresses only please. The winner will be chosen by random.org and notified by e-mail address.Good Luck to all and Happy Reading! Have enjoyed many books by David Liss: “The Coffee Trader”, “A Conspiracy of Paper” and “The Devil’s Company” but this one is spot on with a subject matter that is sure to be my favorite. Thanks for the chance to win. Amazingly enough…This was actually my first novel by David Liss but I look forward to going back and reading more of his works! This was my first David Liss too and I loved it — I’m sad his previous books aren’t fantasy/history but I’m still looking forward to them — I’ve heard rave reviews about them so it bodes well! This sounds unlike anything I have read before, and I would love the chance to win a copy! Thanks for the giveaway! I’d love a shot at this one! Please count me in. Thank you! I hope to win this! I really would love to read it! I’m a follower. Thanks! This sounds great! Please enter me in the draw! 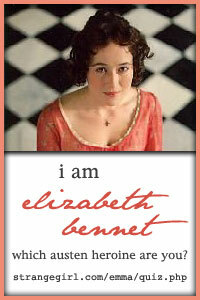 Liss has written some terrific historical fiction, but this one sounds like so much fun! I’m looking forward to reading it and really appreciate the chance to win a copy! I can suspend belief as long as the story really pulls me in – sounds like this one would do just that! Thanks for being a part of the tour. This book soudns intriguing and even more so that it reminds you of a A Discovery of Witches in addition to many other. That book is on my reading list so I’m extra curious. Congratulations to Darlene! She has won her very own copy of “The Twelfth Enchantment” from Stiletto Storytime and TLC Book Tours. Thanks to all who entered and Happy Reading!